The North Balearic Front forms the southern branch of the cyclonic gyre in the northwestern Mediterranean Sea. Its dynamics exhibit significant seasonal variability. During autumn, the front spreads northward during the calm wind periods and rapidly moves back southward when it is exposed to strong northerly wind events such as the tramontane and mistral. These strong winds considerably enhance the air–sea exchanges. 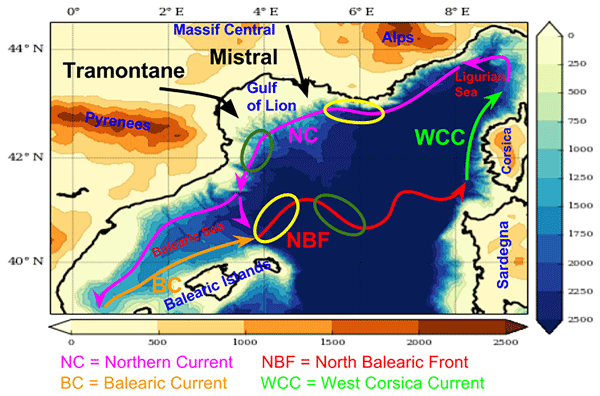 To investigate the role of air–sea exchanges in the dynamics of the North Balearic front, we used observations and a high-resolution air–sea coupled modelling system. We focused on a strong-wind event observed in late October 2012, which was well-documented during the Hydrological Cycle Mediterranean Experiment. The coupled model was able to correctly reproduce the 4 ∘C sea surface temperature drop recorded in the frontal zone together with the observed southwestward displacement of the front. The comparison between the weak wind period preceding the event and the strong-wind event itself highlighted the impact of the wind regime on the air–sea coupling. During the low-wind period the coupling is thermal and dynamical whereas during the strong-wind period the coupling is mainly thermal. The effect of air–sea exchanges on the stratification variations in the frontal zone was investigated with a stratification budget diagnosis. The stratification variations are controlled by diabatic air–sea buoyancy flux, adiabatic Ekman buoyancy flux, and advective processes. During the strong-wind period, the Ekman buoyancy flux was found to be 3 times greater than the air–sea buoyancy flux and thus played a major role in the de-stratification of the frontal zone. The role of Ekman pumping and inertial wave in the advective processes is also discussed.